The festival of Dussehra paints a great pic of India and is highly significant to the Hindu culture and is celebrated throughout India with great energy and enthusiasm. It is celebrated on the 10th day of Ashwin; a month in Hindu calendar. It mainly commemorates the legendary victory of Lord Ram over Raavan, the demon king of Lanka. 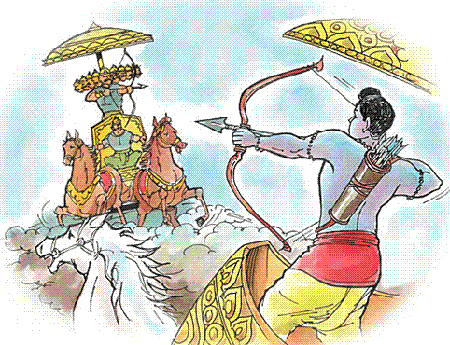 The day is also called Vijayadasami since it was on the 10th day that the war ended in Ram’s victory. Yoovite.com gives you the best online invitation tool to send free e cards to your friends and relatives to the fabulous celebration of Dussehra. You should start couple of weeks in advance to the day of celebration to get everything done correctly. It is usual practice to enact the drama Ram Lila during the festival in addition to elaborate processions in Ram Lila grounds. 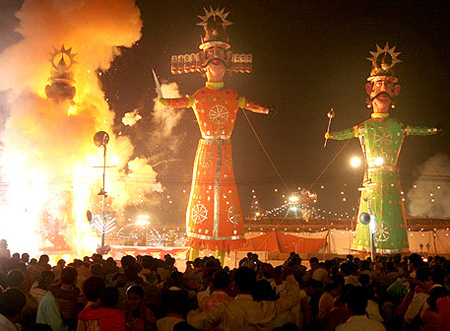 Further, cracker-stuffed effigies of Raavan, Kumbhakarna and Meghanad are set on fire. Depending on where you are, you might want to follow the local tradition. For instance, in Mysore, the celebrations continue for the whole 10 days. Renowned musicians can be arranged to perform at the community hall or temple ground. In addition, folk dance performances can also be arranged along with wrestling competitions and even food and film festivals. Though a community festival, you can have homely celebrations also. You can set up pandals in your house and arrange chairs for the guests to sit. You can make the home and the adjoining street sparkle in brilliance with nice lightings. It is better to have a combined celebration with the help of all your neighbors in the street. That way you can share the cost. Decorate your entrances with “torans” and flower studded strings. Traditional attire is a must for men, women and children. Women can wear bright lehanga-choli, sarees, punjabi-suits etc. while men can wear dhoti-kurta, kurta-pyjama or sherwani. Children can wear the miniature versions of the same dresses. Again, depending on the place where the celebrations take place, the dress will also change. Games and entertainment are a great way to know each other. Sending sms on dussehra is a good entertainment. Arrange some cultural programs for adults and children. Musical chair is a popular game that is suitable for this occasion. Tambola is another game that you can get people to play. Dumb Charades is the next game that kids and adults equally love. Drawing and Coloring competition is yet another activity that you can arrange for young talents. The gifts can be of many types. Buying traditional clothes for your family members is a great gifting plan. You can also gift sweets. Get some baked items, juices and assorted sweets in a single package and gift them. But make sure that the receiver is not diabetic or on a low fat diet. Jewelry is a great option to gift the women in your family. Get bangles, rings, pendants, bracelets, chains, earrings, designer watches etc.